In a festive landscape dominated by pantomime mostly delivered in a very British manner, Slava’s Snowshow is something of a treat. 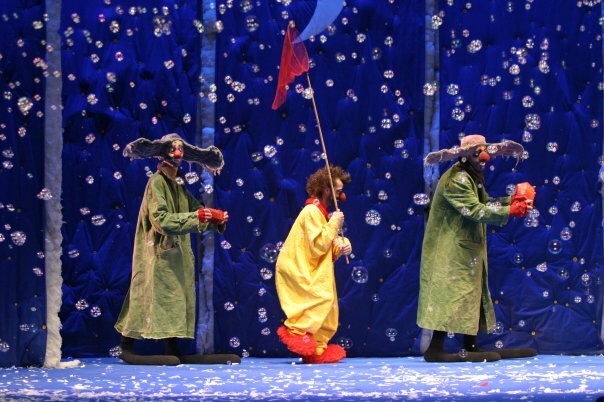 Calling his own style of eccentric pantomime ‘Expressive Idiotism’, Slava Polunin and his band of not so merry men, lead the way into a strange world full of beauty and buffoonery. Children and adults seem equally perplexed as to what precisely is going on, making it not uncommon to hear the question: “What’s that man doing mummy?” answered with, “your guess is as good as mine dear.” But incomprehensibility doesn’t seem to bother the audience overly much; the key here is not to reason why. Slava’s Snowshow is an incredibly well produced ride, incorporating three points in particular that will blow people away (at one point quite literally). But in an impressively crafted piece the simplest things can also make you feel like a six year old child. Jokes based around hats with wide brims or clowns that inexplicably seem to grow half a foot delight both young and old. Other moments feel oddly moving; a creature flying out of the wings leaving a trail of silver glitter in its wake or angels that shuffle around the stage and look out at you for one sad second. Polunin’s blend of surreal imagery and delicate physical clowning is peculiarly effecting. This snow-globe world bleeds out into the auditorium with white paper snowflakes practically covering the first three rows in a thick layer. Grannies throw bunches at their squealing grandchildren, whilst even teenagers can’t resist a little flutter. The stage itself is awash with glowing orbs, and cloudy seas; Slava’s Snowshow takes place in a dream world and as such is full of its own, albeit nutty, rules and hierarchies with which this troupe of clowns mischievously play. There’s rhyme and reason here, but not as we know it. In a show which is mostly mimed, the eclectic soundtrack becomes a powerful tool. Moving from haunting folk melodies to hip swivelling samba, from witty brass ensembles to well known crooners, the rich score gives us a recognisable framework from which we can take tentative steps onto these strange Russian shores. There are snowstorms, giant cobwebs and huge balls which invade the audience – almost stealing the show; at times it could be accused of creating spectacle for the sake of it. But the production also includes the wealth of a great performer’s knowledge and the chance to see the subtle but astonishing craft that he has worked on over decades. By wedding improvised play and crafted ritual together and lacing palpable fantasies into each spectacle, Polunin shows himself to be a theatrical magician of the first order. Slava’s Snowshow is an awe-inspiring and fun-filled experience, but it is also the crowning work of a performer who has dominated Russian clowning over the end of the last century. In a world full of flying carpets and ugly sisters, Around the World in Eighty Days is a welcome change in our panto-infused festive landscape. Kate Bannister’s cheeky ride reminds you why the Victorians were great and whisks you away at a pace that even Phileas Fogg would envy. Inspector Fix (a sweetly officious Jonathan Clarkson) has got it into his head that Fogg’s international jaunt is more to do with theft than a gentleman’s bet. He takes the next steamer after our adventurer determined to catch his man. Savage sacrifices and elephant rides are just a few of the scrapes that follow, in an international caper that would make the Pink Panther proud. Chock-full of makeshift steampunk style, this energetic company takes you around the world in under two hours, bringing colour to every new shore with a couple of saris and some affectionately dodgy accents. David Mildon makes Fogg’s pedantry look gentlemanly and Emily Lockwood as Princess Aouda is a romantic but no-nonsense heroine. Adrian Salmon brings passion to the party with his cheerfully supercilious manservant, Passpartout, and in a sea of rich travel acquaintances, Brigid Lohrey’s Lady Cromarty is a particularly fruity treat. If the second longest running show in the West End was looking a little tired, a rejuvenating orchestral facelift was just what the doctor ordered. Cameron Mackintosh’s ‘little girl’ has shaken off that 1980s synth vibe and finally woken up to the organic noughties. This is a new, richer sound with strong operatic undertones and even the faint echoes of chamber music. Led by compelling ex-‘Phantom…’ Ramin Karimloo as Jean Valjean, this dynamic cast blows a whirlwind through the Queen’s Theatre, hurtling along Alain Boublil and Claude-Michel Schönberg’s famous melodrama. Aided by a swirling revolve and John Napier’s stunning constructivist set, we follow Jean Valjean’s journey across France as he attempts to escape his criminal past and make amends. Hadley Fraser as Javert, Valjean’s fated pursuer, matches Karimloo’s booming vocals and moody stares step for step (at one point rather sweetly causing a premature ovation). Craig Mather and Lisa-Anne Wood do very prettily as lovelorn young leads Marius and Cosette. But it is Alexia Khadime’s soaring ‘On My Own’ that storms the barricades; her plucky and faithful Eponine genuinely pulls at the heartstrings.